Welcome to the RRR May Blog Hop. 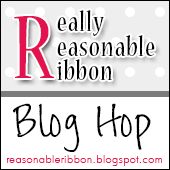 This month the Really Reasonable Ribbon Monthly Ribbon Club Assortment is a fun vintage patriotic mix. Isn’t it great??! Red and blue is one of my favorite color combinations. I just works so well together. My great layered bow was made with my Bow-it-All Tool. Here is a peek at the inside sentiment on my card. I added a length of the Patriotic Boats on Navy ribbon to the bottom of the card. This is a great way to use up shorter scraps of ribbon you can’t bear to throw away. Below are a couple of woven ribbon headbands I made using ribbon from the May Ribbon Club assortment. You can find video tutorials for the headbands as well as the Loopy Bow on the reasonableribbon YouTube channel. Thanks so much for stopping by today. Your next stop is Jessie’s fabulous blog. Bonnie your card is beautiful I just love that bow and the ribbon on the inside used as a border really finishes off the inside and the sentiment is perfect!